Alasdair Kempton is a commencing PhD Student at Monash University, Australia. His research explores issues surrounding the radicalisation process of unaffiliated actor terrorism. His wider research interests extend to the conduct of international and domestic terrorism, state security and state failure. The European Migration Crisis is increasingly linked to an exponentially rising threat of terrorism in Europe and a rapid disintegration of the EU’s security and integrity. However while the narrative of the terrorist ‘wolves’ hiding among the refugee ‘sheep’ becomes increasingly prevalent, little quantitative analysis has been made to substantiate it. This paper seeks to interrogate the evidence behind a key claim prevalent in that narrative; that ‘lone wolf’ terrorists have entered Europe under the cover of the crisis. On the basis of the available data, this paper contends that such a threat is minimal, the crisis presenting a social problem rather than a security issue. In 2015 a record-breaking 1.3 million people applied for asylum in the European Union, sparking what has become known as the “European Migration Crisis” (hereafter EMC). Of these, 29% (378,000) were fleeing Syria, nearly 15% (193,000) from Afghanistan while another 9.7% (127,000) came from Iraq. By the end of the second quarter of 2016 another 305,700 asylum seekers had applied for internal protection in the EU. This wave of migration coincided with a string of deadly terrorist attacks, the largest of which struck Paris (2015), Nice (2016) and Brussels (2016), killing hundreds and injuring more than a thousand. These attacks, and the use of the crisis as ‘cover’ for the infiltration of some of the attackers, legitimised fears that the ‘migrant tide’ brought with it the proverbial ‘wolves in sheep’s clothing’, and once inside, that Europe’s Schengen Area of free movement would allow such terrorist ‘wolves’ to strike anywhere in the EU. Non-refoulement clauses in the European Convention on Human Rights mean that even when suspected extremist or political criminals are detected among refugees, returning them to their country of origin may be illegal, granting them an opportunity to wander Europe (potentially unmonitored). Many European countries have begun re-imposing border controls invoking the ‘exceptional circumstances’ clause of the Schengen Zone, and some doubt these ‘temporary measures’ will prove temporary. Nevertheless, while fear and rhetoric appear to drive policy, with the notable exception of the Paris/Bataclan attack there is little evidence supports the contention that the migrant crisis has aided the infiltration of pre-formed terrorist ‘cells’. Europol reports and the analysis of other attacks in the section below highlight the predominance of local actors (existing residents and citizens) rather than apparent asylum seekers, as the instigators of violence. If anything, the predominant flow of militants appears to be in the other direction; by 2015 it has been estimated that more than 2,000 ‘foreign fighters’ had left from Germany, the UK, Belgium, the Netherlands and Denmark, with only around 20% returning. During the same period Islamic State media endeavored to dissuade residents of the conflict zones from seeking asylum on foreign shores, urging them to stay and fight instead. More recently, however the consistent loss of Islamic State territory over the last 18 months has reversed this trend somewhat as escaping foreign fighters seek to return home. Finally, not all attacks are carried out by organised cells. Increasingly ‘lone wolf’ or single attacker incidents (such as the Nice truck attack) are drawing the attention of policy makers and academics alike. This paper seeks to assess the incidence of radicalised migrant ‘lone wolves’ as an alternative terrorist threat. After specifying the methodology, the paper will compare unaffiliated actor attacks from the ‘peak’ of the EMC between 2015-16 with data from the five years previously. The trends present in this data, as well as an overview of conceptions of radicalisation which explain them, will then be presented. Ultimately, this paper will argue that despite popular narrative, crisis migrants do not pose a significant terrorist threat to Europe. The issues of sudden migration and political refuge span across many factors, from economic and cultural concerns to the value of individual human security. Already some authors have begun exploring the issues of prejudice and fear produced by the crisis. Others have examined the issue of ‘weaponised migration’ directly threatening the structure and integrity of the European Union. In this way, migration is understood by policy makers as “a form of barbarian warfare” not dissimilar to the sacking of Rome. Very little, however, has focused on assessing the objective risk actually posed by the migrants themselves. This paper seeks to address this gap, providing an exploratory quantitative analysis of the objective threat of unaffiliated actor terrorism posed by incoming crisis migrants, and a brief outline of the actors who have committed them. Data for this paper will be sourced from the Global Terrorism Database, as well as Europol’s annual European Union Terrorism and Trend Report. Additional information on specific case studies will be sourced from available publications, reports and news releases. It will focus on the apparently emergent threat of unaffiliated ‘lone wolf’ terrorist actors; self-radicalised individuals or small groups who undertake to commit an attack without direction from a higher organisation. The inquiry will compare such attacks committed with a professed Islamist or Jihadi ideology, that have occurred in Europe in the five years leading up to the crisis (2010-2014), and those that occurred in its peak between 2015 and 2016. In approaching these incidents, only reasonably identifiable acts of religiously or politically motivated violence will be addressed. Non-terrorist incidents involving recent migrants, such as the wave of sexual assaults experienced across Germany in New Years of 2015/16, will be excluded. Ambiguous cases and competing reports, where present, will be identified. This approach will be taken so as to contain the scope of the inquiry to the extant terrorist threat posed by recent migrants, rather than a statement on European security generally. In recent years, great concern has arisen around the possibility of radicalised migrants committing ‘lone wolf’ attacks. ‘Lone wolf’, lone actor or ‘stray dog’ attackers have no direct connection with any existing terrorist organisations, though they may act in response to propaganda from one. ‘Lone wolves’ may latch on to any number of ideologies, blending them with their own personal grievances. Their independence means traditional intelligence sources (Signals or Human Intelligence) have very little to trace, making them notoriously difficult to detect before an attack. Most importantly, a ‘lone wolf’ attack can come from any segment of the population, and need not necessarily be motivated by ‘conventional’ or mainstream extremist ideology. The primary question for this analysis then, is to what extent (if any) are recent migrants/asylum seekers (having arrived in Europe) more vulnerable to ideological radicalisation and subsequent violent action than the existing population? In other words, does the migration crisis exacerbate the existing potential for lone wolf attacks beyond the effects of population increase? The 2016 European Terrorism Situation and Trend Report presents the view that Sunni Muslim Diaspora are “... a real and imminent danger... that will probably continue to exist for a long time” that may be “specifically targeted by Islamist extremist recruiters”. This concern is highlighted in previous works on the ‘homegrown threat’. However, cursory analysis of the perpetrators of lone wolf attacks does not support this. 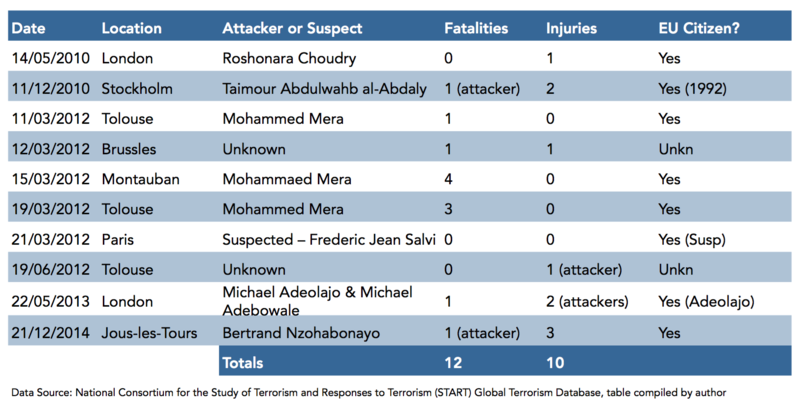 Based on data from the Global Terrorism Database, only ten separate ‘lone wolf’ attacks of declared Islamist motivation were identified between 2010 and 2014, from a sample of 860 attacks. Of these, three were conducted by a single individual, Mohammed Mera, who committed three separate shootings in Toulouse and Montaban (France) in March, 2012. The majority of the attackers (seven of the eight identified) were European citizens, five of whom had been born in Europe. These figures are similar (though some differences naturally arise from differing methodologies) to those presented in Europol’s annual Terrorism Situation and Trend Report across the same period, presented below. While some discrepancies are evident, the overall trend of both the GTD and Europol’s own studies is reasonably conclusive. In the years leading up to the EMC, while acts of terrorism were present in European society the overwhelming majority of them can be attributed to other groups-–most notably separatist groups such as ETA and various factions of the IRA, and enduring left-wing organisations. These groups ar decades (in some cases, centuries) of history operating within Europe. Religiously motivated attacks are a tiny proportion of the overall picture and it is difficult to conceive how they may pose in themselves a significant threat to European security or stability. 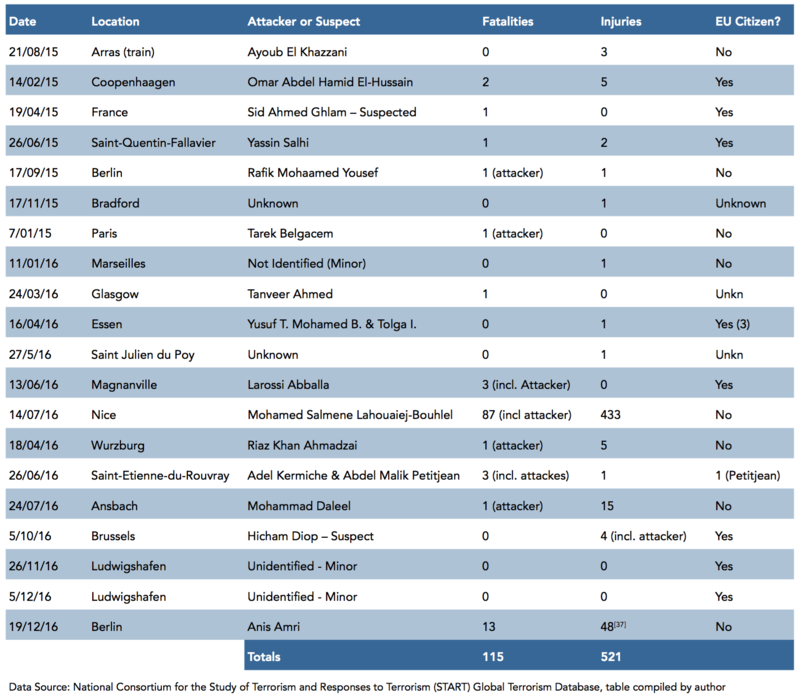 During the peak of the migration crisis between 2015-2016, a further 20 attacks were committed by unaffiliated actors declaring Islamist ideologies (from a sample of 565). Less than half resulted in the deaths of anyone other than the attacker, though two-thirds caused some injury. Only two attacks (Nice, 2016 and the 2016 Berlin Christmas Market attack) resulted in the deaths of more than 10, both were vehicular assaults. Of all the attacks, five appear to have been committed by recent migrants (arrived in the last five years), though only two had been committed by people who had arrived during the crisis. Additionally, there are some unusual cases – for example the stabbing of a soldier in St Julien du Puy was initially reported as a retaliation to French bombing in Syria, but at least one subsequent report indicates this may have been since recanted by the soldier who was assaulted. Finally, some prominent cases were not included in the analysis. The murder of a Polish woman in Reutlingen, despite being committed by a recent Syrian Asylum seeker, does not appear to have been motivated by Islamism in any way. It appears to have been a simple murder case, rather than an act of terrorism. Finally, there is stabbing of a Police officer in Hanover by ‘Sofia S’ in March, 2016. In this case, ‘Sofia S’ may have been in direct contact with ISIS representatives, posing some question as to whether it was truly a ‘lone wolf’ attack or directly ordered by representatives of the Islamic State. Compared to the previous data set, there has clearly been an increased level of unaffiliated actor terrorism in the wake of the migration crisis. Twice as many such attacks (after noted exclusions) have occurred in the two years of the ‘peak’ migration crisis as compared to the previous five. Again, this is reflected in similar data presented by Europol, though again differing methodologies lead to slightly different results. The keys to the ‘lone wolf’ phenomenon are the process of self-radicalisation (the development of extreme ideology without direct association with an extremist organisation) and the radicalisation of action, that is, the decision to commit an attack (McCauley & Moskalenko, 2014 pp 72-73; Neumann 2013 pg 873). The exact process of self-radicalisation is a contested subject, and no clear model has gained consensus yet. McCauley & Moskalenko provide two broad profiles for understanding the motivations of this form of attacker; the caring-consistency profile (motivated by a perceived personal responsibility, a moral imperative to act in the face of injustice, and/or to alleviate broader human suffering) and the disconnected-disordered profile (socially isolated, dealing with personal grievance and typically suffering from acute or chronic mental health issues). Baran, in focusing on specifically Islamist radicalisation, highlights how extremist ideology can be conveyed through ostensibly non-violent organisations such as Hizb ut-Tahrir (the Party of Liberation, HT), acting as “a conveyor belt to terrorism”, priming its members for recruitment or radicalisation further down the track. In the present decade, that same role can be played through online material produced in vast quantities by the Islamic State and others. Other radicalisation theorists seek to delineate theological elements and a perceived ‘normalisation’ of Muslims in the literature as the ‘pool’ from which ‘lone wolves’ are drawn, arguing that ideology is simply the justification, not the root cause, of violent action. While there has certainly been an increase in Islamist violence during the EMC, the contention that such violence is brought by the migrants themselves seems difficult to substantiate. Even in the face of the recent crisis, only a very small minority of the cases involved recent asylum seekers. In those cases, initial reports suggest mental health issues may have been at play. Recent studies into refugee mental health have highlighted the extreme psychological stress recent migrants experience. In particular, the prevalence of severe cases of Prolonged Grief Disorder and Post-Traumatic Stress Disorder in such migrants can be especially high. This supports McCauley & Moskalenko’s contention of the disconnected-disordered profile and its prevalence in Lone-wolf attacks. But what of the attacker’s motivations? Was it as simple as a psychological snapping point or are they driven by an underlying extremist ideology? In the case of the Ansbach Bomber, there appears to be little evidence to support the contention that the perpetrator previously held any extremist beliefs; one neighbor even claimed he had discussed religion with the attacker previously, during which he had outwardly rejected Islamic State’s ideology. The Bavarian train attacker, however, is a less clear case; material found in the attacker’s residence and an apparent Martyr video released after the attack suggests the teen may have already embraced (in part or in whole) extremist ideology preceding the attack. The extent to which he accepted extremist views before receiving the news of his friend’s death, or whether this news triggered his ideological radicalisation as well is as yet unclear. Moreover, in both cases clear ‘trigger points’ which appear to have driven the perpetrators to violent action can be identified; In the case of the Ansbach attack, the bomber had been rejected refugee status and faced deportation, while the 17- year-old Afghan responsible for the Bavarian train attack had recently been notified of a friend’s death in Afghanistan. These appear to be ‘unfreezing’ moments for the attackers, situational crises that pushed them to radical action. Alternatively, this evidence may be taken as a validation of critical interpretations of the ‘lone wolf’ phenomenon (such as those provided by Kundnani). Idealogical motivations in both these cases seem far less prevalent than in other cases of domestic terrorism (from lone-wolf actors or organised cells). The psychological stresses evident in their actions likewise highlight causes other than politics or religion, even if such ideologies were expressed by the attackers themselves. No evidence, however, supports the existence of any ‘conveyor belt’ of Islamist ideology priming migrants for terrorist action. This data generally matches Europol’s own studies which showed that 63% of those arrested on terrorism-related charges in 2015 were EU citizens, the majority of which (58% of total arrests) were EU born. In 2016 that number dropped significantly, to 437 (43.6%) in 2016. In the vast majority of Islamist terrorism cases identified through the GTD (excluding those identified as migrants, recent and past, and cases where biographical details were unavailable), the perpetrators were descendant of migrants, either second or third generation. This is in line with Ganor’s contention that the primary threat of ‘lone wolf’ Islamism comes not from migrants themselves (who are often fleeing the horrors of conflict, and enjoy a relative increase in their well-being following migration) but from disaffected children who “reject minority status” and begin a process of “downward assimilation”. Psychological research has also highlighted the vulnerabilities of second-generation adolescent migrants to further stress-factors post-settlement, leading to an increased risk of emotional and behavioral problems. Additionally, it is possible that the crisis itself is polarizing existing communities within the state and thus feeding the conditions for radicalisation. As it has begun to lose it’s ‘local’ war in Iraq, Islamic State media has shifted from the recruitment of foreign experts and fighters towards encouraging ‘lone wolf’ actions. Given the massive rate at which IS still publishes this material, both in their periodical Dabiq and across numerous social media platforms, it is possible this campaign will contribute to increasing ‘lone wolf’ radicalisation in the future. Nevertheless, such campaigns require a sympathetic ear in order to be effective, often relying on exploiting existing issues, such as those outlined above, shaping dissent and anger rather than creating it. The ‘lone wolf’ issue is not therefore an extant security threat per se, but a potential long-term issue of social policy, integration and mental health. While the broader threat the EMC poses to Europe’s security and stability are complex, there are a number of false narratives around the threat of terrorism that should be addressed. With the exception of the Paris and Brussels attackers (who were in fact citizens rather than true asylum seekers), there is little evidence to suggest incoming ‘migrants’ have taken part in organised Islamist cells. Though some of those attackers may have utilised the crisis as cover to enter Europe, the organised attacks were committed entirely by EU citizens. Moreover, as citizens these attackers may well have entered the country through other means without detection (legally or otherwise), as other terrorists have before. Unaffiliated radicalisation also appears to be the domain of either long-term residents or citizens, with only a handful of recent migrants being identified in this data–only two who had arrived in the peak of the EMC. That being said, in a minority of asylum cases, extreme external psychological stresses combined with ‘snapping points’ such as refused asylum, may contribute to a violent reaction such as a ‘lone wolf’ attack. In these incidents, while the attackers may invoke popular ideologies, it is more likely the psychological stresses, rather than true attachment to a cause, drive their actions. There is a possibility that large waves of migration may contribute to populations that are vulnerable to radicalisation; particularly unaccompanied adolescent refugees and second generation migrants. Finally, ISIS’s apparently impending defeat in Iraq and Syria may reshape the threat landscape somewhat as foreign fighters return to their homes, potentially retaining grievances or radical ideologies. Whether these returnees harbour sufficient motivation to commit a violent act remains to be seen. Data is likewise lacking on the effectiveness of the Isalmic State’s shift towards encouraging lone wolf action, though recent events in Manchester and Barcelona suggest that some influence may well be present. More research to uncover the processes that drive radicalisation, combined with increased social and mental healthcare could well contribute to a reduction in these incidents. Nevertheless, that possibility cannot be considered an ‘extant threat’ by any stretch of the imagination, nor can present migratory policy be dictated by the potential actions of the next generation. The social challenges posed by the EMC are numerous, but migrant terrorism is not among them. Allan Hall A, 2016 “Teenage female ISIS fantatic was ‘radicalised at the age of seven and stabbed a German police officer because she was unable to make it to Syria” Daily Mail March 5 <http://www.dailymail.co.uk/news/article-3476986/Teenage-female-ISIS-fanatic-radicalised-age-seven-stabbed-German-police-officer-unable-make-Syria.html > accessed 26/7/2017. National Consortium for the Study of Terrorism and Responses to Terrorism (START). (2016). Global Terrorism Database. Retrieved from https://www.start.umd.edu/gtd The GTD is an open-source database of terrorist events from around the world, maintained by the National Consortium for the Study of Terrorism and Responses to Terrorism (START) and the University of Maryland. For the purposes of this study, data sets were constructed by filtering the results to “Western Europe”, and excluding cases that did not meet (or were ambiguous) all three of the GTD’s criteria for terrorism. For notes on their collection methodology and the criteria, please see their website. Datasets used in this analysis in CSV form are available from the author, or may be freely replicated by following this methodology on the GTD website. There is some contention as to how ‘alone’ such actors may be and still considered truly ‘lone wolves’. Hamm & Spaiij contend such a definition should be contained to only the actions of a single individual (Mark Hamm & Ramoon Spaaij, The Age Of Lone Wolf Terrorism [Colombia University Press: New York 2017]). Others, such as Simon, allow for individuals acting with support from one or two others, but not connected to a wider organisation (Jeffrey Simon, Lone Wolf Terrorism: Understanding the Growing Threat [Prometheus Books: Amherst, 2013]). For the purposes of this analysis the exact numbers are not important, what is is whether these actors have connections with transnational or local organisation which provides funding, resources or exerts command and control over the cell. When these connections are absent, those actors will be considered “unaffiliated”. The use of the term ‘lone wolf’ is only relevant insofar as it has become popular in both public and academic discourse. There is also the question of what threat might be posed by lone actors reacting against the recent migration wave. This violent reaction to a perceived ‘tide of Muslim migration’ was demonstrated in the Anders Breivik attacks in Norway, 2011. In combination with recent events (the massive increase in migration and incidents such as the New Years Eve Assaults) this path of radicalisation is an undeniable factor in European security. Nevertheless, it is not a threat posed by the migrants themselves, and thus is not examined in this paper. See Ganor, op cit; Bruce Hoffman, “The Evolving Nature of Terrorism” The Social Contract 21, (2010 No 1): 33-40; Nail op cit. Taimour Abdulwahab al-Abdaly, responsible for a failed suicide bombing in Stockholm (2010) and Betrand Nzohabonayo, who attacked a police station with a knife in France (2014), were both born overseas (Iraq and Burundi respectively), though they both been citizens of their countries of residence for many years. While not listing it, the 2014 report acknowledges “two persons were killed in the UK in two separate terrorist attacks, one motivated by religious extremism and the other by right-wing extremist ideology”. Europol, European Union Terrorism Situation and Trend Report (TE-STAT) 2014 [Europol: The Hague, 2014]). These incidents are (based on correlation with the GTD) the murders of Lee Rigby by Michael Abebolajo and Michael Abebowale and the stabbing of Mohammed Saleem by white supremacist Pavlo Lapsyn. It is not clear why these attacks are excluded from their reports. Additionally, the GTD dataset incorporates 24 entries coded as “Anarchists”, as well as numerous named organisations with similar leanings. It is unknown how such groups are coded by Europol. Allan Hall A, 2016 “Teenage female ISIS fantatic was ‘radicalised at the age of seven and stabbed a German police officer because she was unable to make it to Syria” Daily Mail March 5 <http://www.dailymail.co.uk/news/article-3476986/Teenage-female-ISIS-fanatic-radicalised-age-seven-stabbed-German-police-officer-unable-make-Syria.html > accessed 26/7/2017. Due to the offenders age and apparent ‘radical’ family, this attack has been removed from the ‘lone wolf’ cases. GTD lists injuries as 48, however subsequent media reports this year have presented alternate figures of between 50 and 58 (Berliner Zeitung, “Anschlag in Berlin: Zahl der Verletzeten leigt nun bei 56” Berliner Zeitgung 6 March 2017 < http://www.berliner-zeitung.de/berlin/polizei/anschlag-in-berlin-zahl-der-verletzten-liegt-bei-56-26147624 > accessed 5/09/2017, Samuel Osborne, “Independent “Berlin ‘attack’ as it happened: At least nine killed and 50 injured as lorry ploughs into Christmas market” The Independent December 2016 http://www.independent.co.uk/news/world/europe/berlin-christmas-market-attack-truck-dead-injured-live-latest-updates-kaiser-wilhelm-memorial-church-a7485406.html accessed 05/09/2017). In the 2015 and 2016 reports, this category replaced “Religious Extremism”. Clark McCauley & Sophia Moskalenko, “Towards a Profile of Lone Wolf Terrorists: What Moves an Individual From Radical Opinion to Radical Action” Terrorism and Political Violence 26 (2014 No 1): 69-85; Peter Neumann, “The trouble with Radicalization” International Affairs 89 (2013 No 4): 873-893. Neumann terms these “cognitive radicalization” and “behavioural radicalisation” (sic) respectively (Neumann, 2013 . 873). There are undoubtedly other terms as well, but they reflect essentially the same processes. Neumann, op cit p. 874. McCauley & Moskalenko, op cit; Clark McCauley, Sophia Moskalenko & Benjamin Van Son, 2013 “Characteristics of Lone-Wolf Violent Offenders: A Comparison of Assassins and School Attackers” Perspectives on Terrorism 7 No 1: 4-24. McCauley and Moskalenko also highlight the need for weapons experience or other opportunity in order to ‘cross the gap’ and commit an act of violence (2014 pp 81-8). However the recent attack in Nice shows how opportunities may be created through surprisingly simple means. Restricted access to firearms or bomb-making materials need not slow down a creative or determined mind. Olterman, op cit, Eddy, op cit. Olterman, op cit. BBC 2016 op cit. Europol, 2016 op cit p. 11. These statistics reflect all persons arrested for terrorism-related offences, including aiding foreign fighters and attempting to leave to serve foreign groups, and are thus not representative of the lone wolf threat per se (Europol, 2016 pp 10-11). Nevertheless they are supportive of the trend towards EU citizens offending, rather than migrants. Europol, 2017 op cit p. 50.